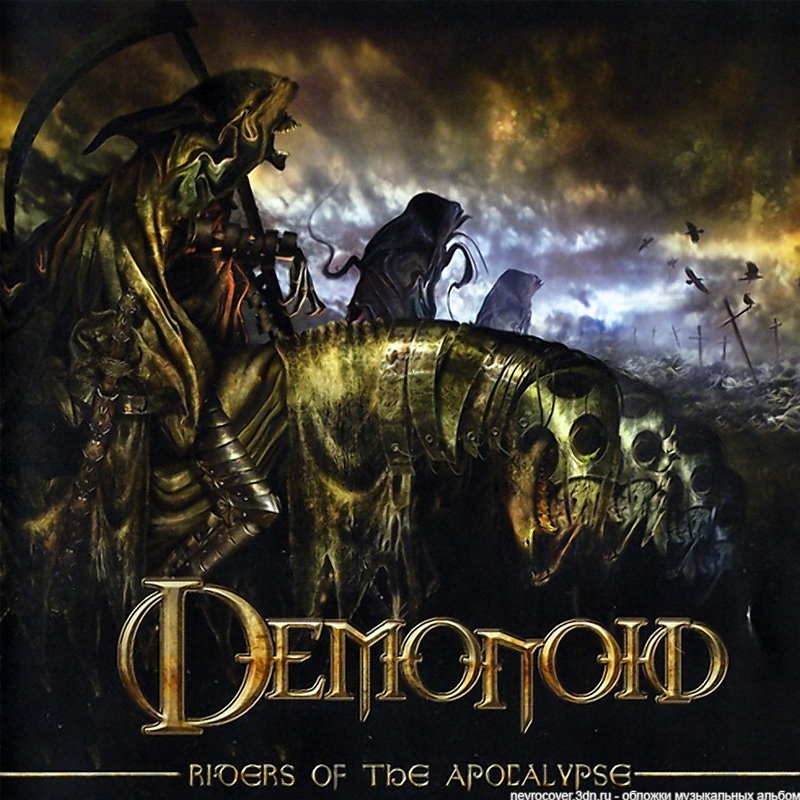 If I had to guess what a side-band made up of members of the band Therion would sound like, the last thing I would guess is Demonoid’s Riders Of The Apocalypse—especially after Therion’s latest, the double album Lemuria/Sirius B. Demonoid is Kristian Niemann (guitar), Johan Niemann (bass) and Christofer Johnsson (vocals) of Therion and Rickard Evensand (drums) formerly of Soilwork (currently with Chimaira). Stupid name aside, Demonoid is a blistering slab of death metal with heavy thrash leanings and shades of black metal. The two openers of the album, “Wargods” and “Firestorms,” have the breakneck speed and suffocating heaviness reminiscent of Under The Blade-era Defleshed. The third track, “Witchburners,” introduces a more melodic thrash sound chockful of musical hooks and cool subtleties of which these guys are masters. “14th Century Plague” is a short, three-minute, slow-tempo diversion, but then the very strong “Hunger My Consort” kicks back in for more melodic thrash and musical hooks. There are nine tracks in all, clocking in at about 47 minutes. There’s a good amount of variation on this album, but I’d have to say “Witchburners” and “Hunger My Consort” pretty well represent the majority of Riders Of The Apocalypse. Great production, excellent death vocal performance and killer solos round out Riders of the Apocalypse. I was pleasantly surprised by this album and if you haven’t already guessed, I enjoyed the hell out of it. This review originally appeared in Written in Blood, December 2004, Issue 192.